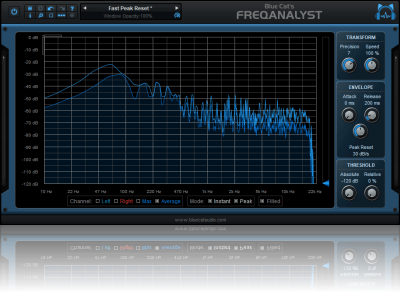 "What you cannot hear, Blue Cat's FreqAnalyst shows it to you, for free!" 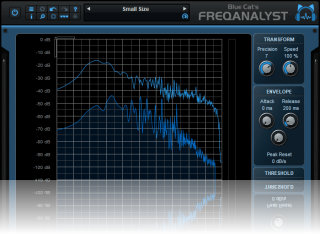 For more advanced capabilities, check Blue Cat's FreqAnalyst Pro plug-in, an extended version that offers many more features, such as saving/restoring curves, precise measurement tools, 3D spectrogram view, MIDI output. 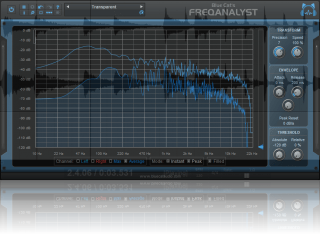 For multiple tracks analysis, you can use Blue Cat's FreqAnalyst Multi plug-in. Available as: Mac-AAX, Mac-AU, Mac-RTAS, Mac-VST, Mac-VST3, Win-AAX, Win-RTAS, Win-VST, Win-VST3, Win x64-AAX, Win x64-VST, Win x64-VST3. "Blue Cat's FreqAnalyst has been tested by the Softpedia labs and found to be completely clean of adware/spyware components. We are impressed with the quality of your product and encourage you to keep this high standards in the future." Any VST / RTAS / AAX compatible host software (32 or 64 bit). Refreshed GUI design, with improved usability and improved touchscreen support. Added Retina displays support on Mac (text and graphs using high resolution). 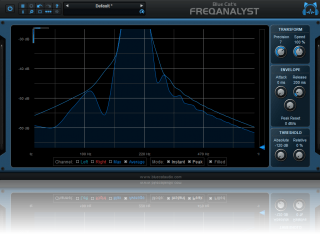 Spectrum analysis is now performed in the background and does not affect audio performance. Fixed minor compatibility issues with Mac OS High Sierra and Mojave. Dropped support for Windows XP and Mac OS X 10.6 and earlier. Dropped support for legacy DirectX plug-in format. Fixed: audio did not pass thru the plug-in in some VST3 hosts. Fully compatible with previous versions of the plug-in (except for VST3 on Mac, as explained below). Warning: because of a bug of the initial VST3 release, this new version may not work with existing sessions that used the VST3 format. See this blog post for more details and how to fix it. Fixed AAX version not showing up in Pro Tools 10.3.5 on Windows. Fixed compare button issues in Pro Tools. Mac-VST: Fixed window resize issues on Cubase and Nuendo (Mac). Mac: Control MIDI settings dialog now brought back to front when already opened in the background. AAX/RTAS on Mac: Fixed audio engine freeze or error issue with Pro Tools on some Mac configurations. AAX on Mac: Fixed compare button that did not work well when using factory presets or any preset created on Windows. Performance improvement when running under high CPU load for other platforms. New animated user interface with multiple display sizes. Automation range and response curve can now be customized for each parameter. AAX plug-in format is now also supported on Windows. Plug-in name has been shortened for a clearer display in mixer view for most host applications. Changed the default VST install path on Windows. Improved default response curve for automation and MIDI control. Reduced VST plug-in loading time. Fixed presets-related crashes in Cubase on Mac. Note: this new version can be installed side by side with the previous version for backward compatibility reasons: installing this new version won't break your previous projects. Select and zoom with one click. Improved consistency with our other analysis tools. Performance improvements (the plug-in now requires an SSE2-enabled processor). Default release time is now shorter. 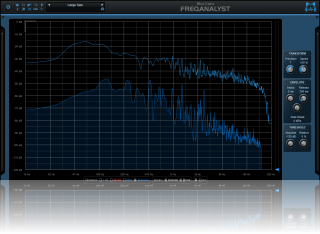 Fixed issue with Freeze button not freezing all curves on the stereo version. RTAS plug-in bug fix: when using both the mono and stereo versions in the same session, the controls of the instances were linked together. Win x64: fixed issue with some hosts not opening the plugins. Win x64: fixed issue with settings window that was not displayed properly in some hosts. Mac: fixed user interface crashes in some hosts, when used with particular display settings. Mac-AU: fixed user interface resizing issue when changing skin in some hosts (Logic). New Windows Installer (much faster install, improved upgrades). Blue Cat's Skinning Language 1.6.1 support. New skins with enhanced usability and new look and feel. New toolbar to access main features. Import/Export presets in a host and platform independent format. Improved parameters display in host application and settings window. Improved graphical display performance and smoothness. Load/Save presets in a host-independent format: you can now share presets between the directX and VST versions. New toolbar to access main functionalities. Reduced memory consumption when using several instances. It is now possible to choose wether displayed curves are filled or not. Improved the display of parameters values in the MIDI settings panel and the host application. Bug fix (VST): when loading a project or changing presets, some host applications could hang.